Explorer John C. Fremont first saw Lake Tahoe in 1844 from the top of Red Lake Peak, which is located south of the basin and what is now Carson Pass. He named it Lake Bonpland after a botanist, but then changed it to Mountain Lake. Subsequently it was named Lake Bigler after a California Governor. The US Department of Interior didn’t care for it either, and commissioned Dr. Henry Degroot, a journalist, to come up with a name. Degroot suggested “Tahoe” an Indian name meaning “big water”. It took decades before the name finally stuck, thanks to action in 1945 by the California State Legislature. In the 1860’s, Tahoe was the center of a lively commerce that involved the silver mines in Virginia City, where the Comstock Lode was discovered in 1859, and the Central Pacific Railroad, which was pushing over the Sierra toward the town of Truckee. To supply wood to the mines, the new boomtown and the railroad created an extensive logging empire which was established on the east shore of the lake, from Incline Village to Glenbrook. The loggers’ clear-cut the entire shore line and left scars for decades, until the early 1880’s. By then, the only business that showed promise was tourism and thus began a new land rush to build resorts. It is interesting to note that nearly every community in Tahoe owes its existence today to a resort or hotel. During the 19th and early 20th century, travelers from San Francisco would take one train to Truckee and from there board a second train that rode on a narrow gauge track to Tahoe city. When they arrived at the Lake, they would have their choice of fabulous resorts, such as Tahoe Tavern, in Tahoe City; Brockway Springs Hotel near Crystal Bay; the Tallac House, on the West Shore, and the Glenbrook Inn on the East Shore. Of course, without roads, the only way to reach distant resorts was by passenger ferry and a network of steamships, developed to service the lake. None of the historic inns have survived to modern times. Most were destroyed by fire, a problem that constantly bedeviled Virginia City and Truckee. What fire fighting methods there were was primitive at best. Today, Lake Tahoe endures undiminished grandeur. Nothing can diminish first impressions driving to Lake Tahoe and seeing this giant pool of indigo-blue water cradled between mountain ranges. Nothing can detract from the experience of entering Emerald Bay and finding yourself surrounded by cathedrals of granite. It is, as the famous American author, Mark Twain wrote, “Surely the fairest picture the whole earth affords.” I believe the City of South Lake Tahoe is located in one of the most unique settings in the world — at the edge of an Alpine lake of great natural beauty and environmental value. Since the late 50’s, the attraction of the scenic wonders, the adjacent Nevada gaming casinos, boating, hiking, and the excellent skiing facilities, has made the area a popular year-round destination resort. Lake Tahoe is located 200 miles northeast of San Francisco, CA. and 58 miles southwest of Reno, NV. in the Sierra Mountain Range. Lake Tahoe is the North American Continent’s largest Alpine lake and is 22 miles long, 12 miles wide, and covers a surface area of 191.6 square miles, and has 72 miles of shoreline. The Lake’s surface is 6,226.95 feet above sea level and the natural rim is 6,223 feet above sea level, making it the highest Lake of its size in the United States. Mt. Tallac at 9,735 feet is the highest peak rising from the shoreline. The highest point in the Tahoe Basin is Freel Peak at 10,881 feet. Lake Tahoe is the third deepest lake in North America and the tenth deepest in the world. (Lake Baikal, in Russia, is the deepest at over 4,600 feet.) Tahoe’s deepest point is 1,645 feet near Crystal Bay. The average depth of Lake Tahoe is 989 feet. The estimated 39.75 trillion gallons of water contained in the lake is 99.9 percent pure, with visibility to 75 feet below the surface. If Lake Tahoe was completely drained, it would cover a flat area the size of California to a depth of 14 inches, but would take over 700 years to refill. Lake Tahoe is, geologically, a “young lake” having been formed 10,000 to 11,000 years ago. Glaciers are responsible for carving out the broad U-shaped valleys that hold Emerald Bay, Fallen Leaf Lake, and Cascade Lake. Sixty-three streams flow into Lake Tahoe, but only one, the Truckee River, run past Reno and into Pyramid Lake. Lake Tahoe loses much of its water to evaporation. If the water that evaporates from the Lake every 24 hours could be recovered, it would supply the daily requirements of a city the size of Los Angeles. Although the summer’s heat can warm the upper 12 feet to a comfortable 68 degrees Fahrenheit. Lake Tahoe never freezes over in the winter; this is due to the constant 39 degrees Fahrenheit maintained at depths below 700 feet, largely because of the constant movement and volume of water. The sun shines at Lake Tahoe approximately 274 days a year. Weather in Lake Tahoe and the Sierras can be unpredictable — snow, for example, has fallen in every month and averages 420 inches a year. Population: South Lake Tahoe, including the Stateline area, has a permanent, year-round population of 34,000. Sunshine: The sun shines at Lake Tahoe during 75% of the year, or 274 days. Lake Tahoe vacations are popular for obvious reasons to those that seek fun in the sun and to explore the many popular attractions in Lake Tahoe. Snowfall: At lake level, annual snowfall averages 125 inches. At alpine skiing elevations, the snowfall averages 300 to 500 inches each year. Lake Tahoe Gaming: There are six 24-hour casino hotels in the South Lake Tahoe area. Together, these Lake Tahoe Casinos and Tahoe casino hotels have a total of 7,051 slot machines and 411 game tables. Lake Tahoe Hotels: There are hundreds of hotels in Lake Tahoe including South Lake Tahoe hotels and North Lake Tahoe hotels. Popular ones include our very own The Bluelake Inn. Lake Tahoe Vacation Rentals: A vacation rental in South Lake Tahoe is an alternative to a vacation rental in Incline Village or a casino resort hotel. 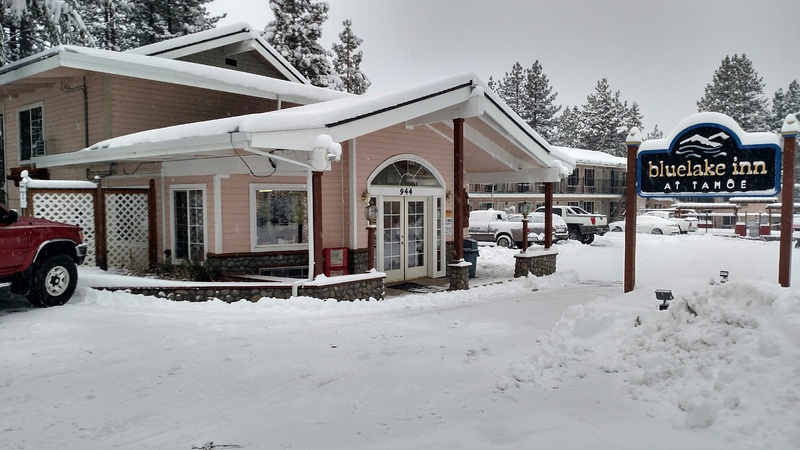 For a hotel reservation in Lake Tahoe the The Bluelake Inn in Lake Tahoe is a fantastic solution if you like the benefits of both as it has the feel and amenities offered by both a vacation rental and a hotel. Skiing: Skiers can hit the slopes on one of the 182 ski trails in the midst of more than 8,800 total ski resort acres. The longest ski run in the area is 5.5 miles long. Lake Tahoe’s greatest vertical drop is 3,600 feet. Both runs are at Heavenly. Fishing: The biggest fish ever caught in Lake Tahoe, a Mackinaw lake trout, weighed 37 pounds and 6 ounces. Famous Residents: Famous neighbors include and have included Charles Bronson, Cher, Natalie Cole, Sammy Davis Jr., Liza Minelli, Wayne Newton and the Captain and Tennile. Movies Filmed at Lake Tahoe: Indian Love Call, starring Jeanette McDonald, was the first movie to be filmed at Lake Tahoe in the 1920’s. Subsequent films have included The Godfather, starring Al Pacino and Marlon Brando and The Bodyguard, filmed at Fallen Leaf Lake, starring Kevin Costner and Whitney Houston.